As a long time reader of Michael’s site, it's an honor to have my own words added to his list of pop culture collectibles. Thanks Michael! If you are reading this, there is a good chance you were a part of the wonderful world of 80’s pop culture. 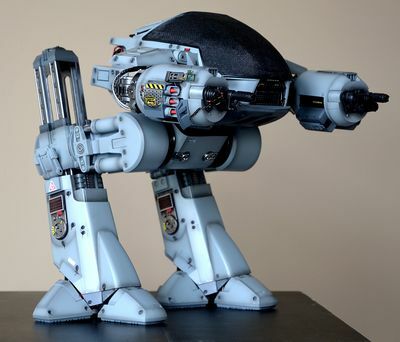 And let’s be honest, a lot of the designs that came out out the 80’s, haven't been topped even with the advent of CGI. Stop motion may have been a little jerky and not smooth like the slick work of today's animation, but they were real, tangible pieces that were made by amazing craftsmen. And as fan, I always had the dream of having one of my very own. The figure I'm reviewing today is really a great representation of this character. 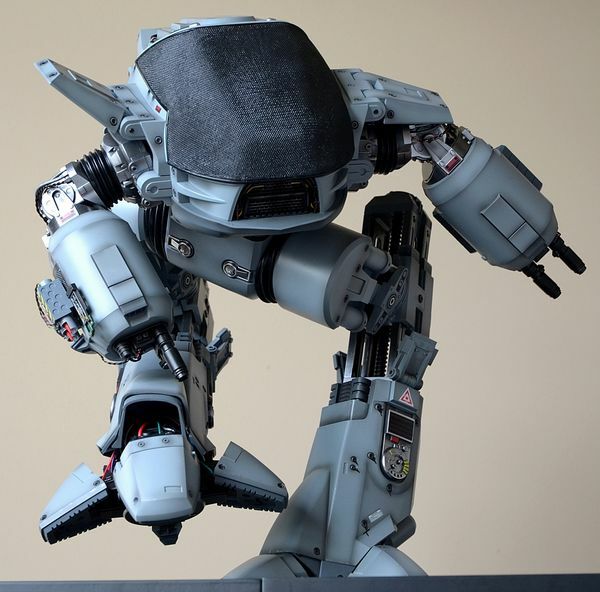 The Enforcement Droid 209 or ED-209 for short from Robocop. This is Hot Toy’s second outing of this character and it appears they have made some significant upgrades. The original was released in, what I believe, was 2006 and to quote Dylan, “the times they are a-changin”. Not only have the figures gotten greater, so have the prices. If you want to see the original and read the always eloquent Jeff Parker's review he did for Michael back then, you can do so here. I’m not going to go into too much detail about the history of this movie character, because though I love the design, there are better resources out there to talk about the specifics. 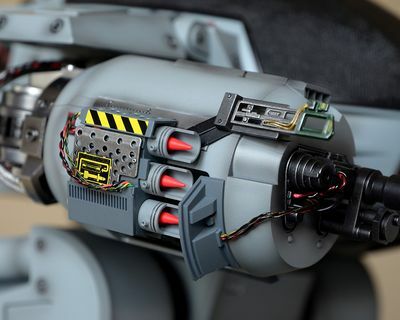 Here is a site that has some really great information on the making of the movie prop. Like the original, the new Hot Toys figure is one beautiful work of art. Let’s get it going! 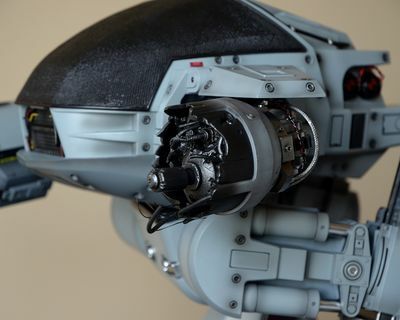 Anytime Hot Toys includes a carrying handle on the shipper, you know that you are in for a treat. The figure’s box inside is a simple but clean design that is monochromatic in color which can often lead to a some what uninteresting design, but the masters at HT chose to mix up the surface textures to bring more spice to the basic color pallet. 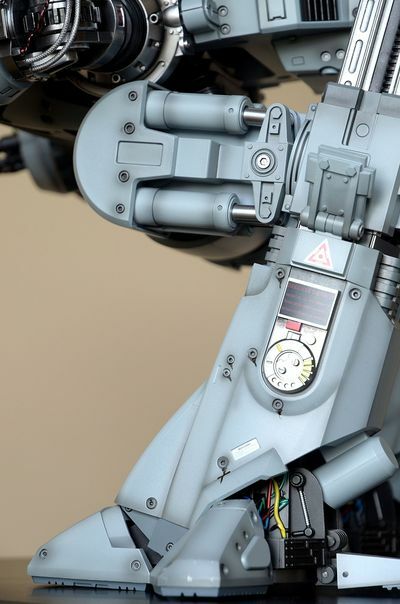 There is an embossing of chrome lettering for the name of the figure and then a raised textural surface over the image of the robot and background. The image itself is a really nice stylistic illustration of a picture of the figure. The texturing adds a really wonderful touch to the image making it even more interesting to look at and helps pops it out from the rest of the box. When you open the top, you will find a Styrofoam container that houses the figure and its parts. On the foam case is a nice molded lid with ED-209 sunk into the surface. Inside the foam container holds all the parts of the figure. I say parts, because this monster is going to need some basic assembly. Each part has it’s own nook in the foam box and is individually bagged. HT has been using this style recently for their bigger figures and also their handling of the new die-cast line. This is completely collector friendly and even goes so far as to leave off the little plastic circle stickers used to seal the box. The whole package looks elegant and seems to protect the figure very well, but is a bit minimal compared to some of HT's past designs. I don’t display my boxes, but if I did, this one would be worthy of a front and center position. Lets be honest, this is where we decide if this figure is good or not. If you haven’t noticed from the pictures, this one is definitely a good one. I've often wondered about how much of HT’s stuff today is hand sculpted in comparison to using computer software. Either way it takes great skill to create these complex pieces and this is wonderful example. I’m no expert, but this looks to be pretty accurate to the film with all the bolts, wires and textures sharply defined and a few of the details are not just sculpted on the surface, but are applied parts. This is one of those figures that will look great from a distance, but will get even more amazing as you get closer. Pay particular attention to the right side of the figure for a wonderful example of this. 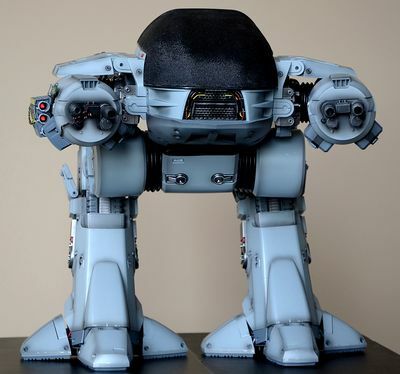 One trade mark of ED-209 is his speaker like dome. The sculpt of this one is really beautiful and has great detail that captures the light really well. In the film, there were two basic looks of ED, the full size prop and the stop motion puppets. The dome in the full size prop is more flattened out compared to the puppets, which were much taller. I think HT went with a nice balance between the two for this figure. Once again you can compare the figure to the originals here. There has been concerns about the material of the dome because the 2006 figures have not age well. After many years, many have reported cracks and splits which have forced collectors to make substantial repairs to their figures. Like the original, this dome is also rubber, but finger crossed won't suffer the same fate. But I guess we shall see in five years. Hot Toys has been the king of paint for a long time and while this paint is outstanding, I do have a few small quibbles on this figure. The whole figure has a bluish base coat with the addition of a very well executed weathering. This adds visual interest while accentuation a lot of the surface details. There are several areas that have some really wonderful metallic parts that really give illusion of being made of metal. There are also several decal/tampo details of cautions and warnings around the figure that add a lot to the realism. As a whole, the figure is very well rendered, but the problems I have are in the application of small drips/runs coming from several of the bolt heads in the legs. I remember seeing a couple of spots in the movie, but not nearly the quantity that HT has given us. I think this is a good example of less is more. At first glance it makes the figure look like its leaking oil from all over it’s legs, but under close inspection, it hurts the realism because it’s been rendered in a more of clip art style. I find them a distraction more than a enhancement. It may only be on mine, but there are drips running both straight down and at an angle. If it was used sparingly in certain locations I could see how they may behaved differently, but when the bolts are right next to each other, they look strange. I would have preferred they left this step out of the painting process. Looking at the prototype pictures, it seems they originally used a lighter color or thinner coverage of paint, which seemed to have worked well. Its the heavy application that I think causes the problem here. 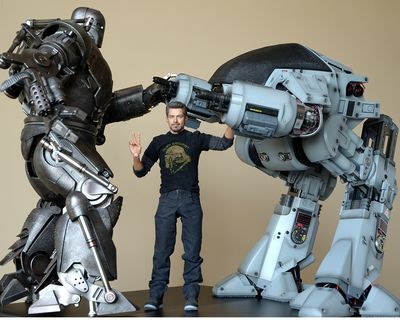 Even though they are a distraction, the overall paint job is what we have come to expect from Hot Toys. This beast was built for posing. It has multiple points of articulation that make it versatile enough to get into about any pose that you want. Starting from the ground and working our way up we have all four of the toes pivoting, with the front toes having greatest range of motion. They can extend down quite far, which allows the nice sculpted work to be shown off that is normally hidden under the armor. HT could have stopped with the toe pivots, but instead they have also given the toes spring sections to allow the armor plates to move. 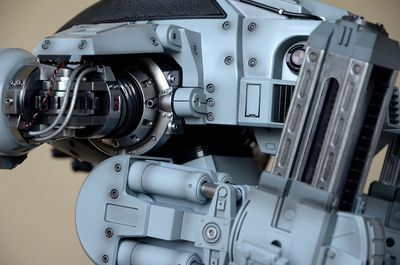 It’s that kind of detail that makes HT the kings of movie robots. Moving up the calf, there is a twist joint where it meets the knee. There isn't a lot of motion there, but the little that it has, will aid in getting the feet lined up when using a dynamic pose. We have two small flaps on the sides of the legs that move up and down and big improvement from the old figure is the addition of the slides that allow the figure to go up and down the extensions. They’re a little tough to move but I'm guessing its to help support the weight of this beast. We then have the knee sections that are a ratcheting pivot joints. Not a lot of movement but looks to be the same as the movie. These joints also have a small amount of twist to allow the leveling of the legs. At the same junction, there are pivoting side plates with articulated cylinders. These help keep everything aligned when the knee joint is moved. Then moving up to the hip joints which are double ended barbell joints. These give a great range of motion for the legs. There is, what I guess, is a ball joint where the chest meets the waist. Not a great range of motion but still helpful. The arms have several points of articulation in the shoulders along with ratcheting pivots at the elbows. They can travel about 170 degrees from front to back. 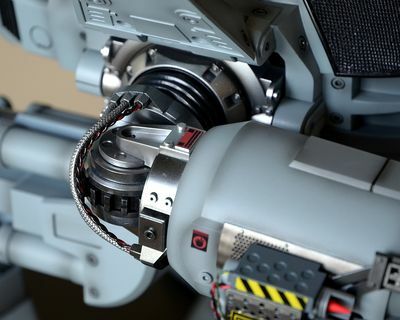 Gun pods that rotate and finally the the top flaps that cover the shoulder joints of the arms. Sorry for the long explanation, but the articulation can easily be overlooked when looking at pictures of this figure. Hot Toys has given us lots possibilities. This guy doesn't come with much but what it does, is nice. HT has include the blown apart left arm which has been sculpted really well, with good details like wires and tubes splayed out. The only criticism is the black burn marks are a little simple in design and the black itself is too shiny. It would have looked more realistic with a flatter black. One thing I have read from other collectors that could have taken this figure over the top would be the control machine from the board room. But the arm is a great touch that helps to average this figure out. He also come with a remote for the sound feature with nice raised lettering spelling out ROBOCOP. When not in use, it can be used as a nice display plaque. Sound features on toys have been around forever, but we seem to be seeing it work its way into the high end market these days. I think this is HT’s first time offering a sound feature in a figure, but I could be wrong. 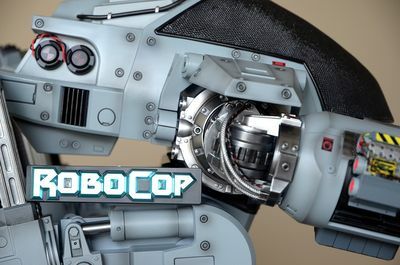 It’s a little hard not to think they are riding the coat tails of Enterbay on this because of their own recently released Robocop with the same feature. Maybe its an example of great minds thinking alike. Who knows, but let’s just focus on what HT and ED have given us. The remote control mentioned in the accessories, has an on/off switch and utilizes the “BO” as the control button. It comes with its own watch batteries, but you will need to supply the three AAA batteries for the figure.When you switch the figure on you get a start up sound then when you hit the remote button, you get two more machine sounds followed by three dialog/noise sounds. The start up track and the first button controlled track may be the same. I honestly can’t tell. The sounds are on a loop and you can’t skip the tracks. You have to wait till the track is done before playing the next. The machine sounds seem to be taken from the movie while the dialog sounds are new recordings. OK the good. I would say the speaker is good with nice range of of tones. Its not as good as smartphone speakers but has enough range that its a bit better than what you would expect from a mass produced toy. The remote is handy and can double as a display piece when not in use. Some of the sounds are nice and clear, especially the mechanized sounds. Now the bad. The voice that is used is definitely not the one from the film. It was clearly recorded using a non-american dialect and the pace of speaking is not true to the movie. And finally the pronunciation of some of the words is wrong. I'm not going to harp on this, nor speculate on why the choice was made to make new recordings instead of using the original, but I will say that if an accurate sound feature is important to you, then you will be greatly disappointed. With all the articulation, this is fun figure to pose and get set up. I think if the sound feature was more accurate to the film, people would get more enjoyment from it. It’s always hard to say is this worth it. 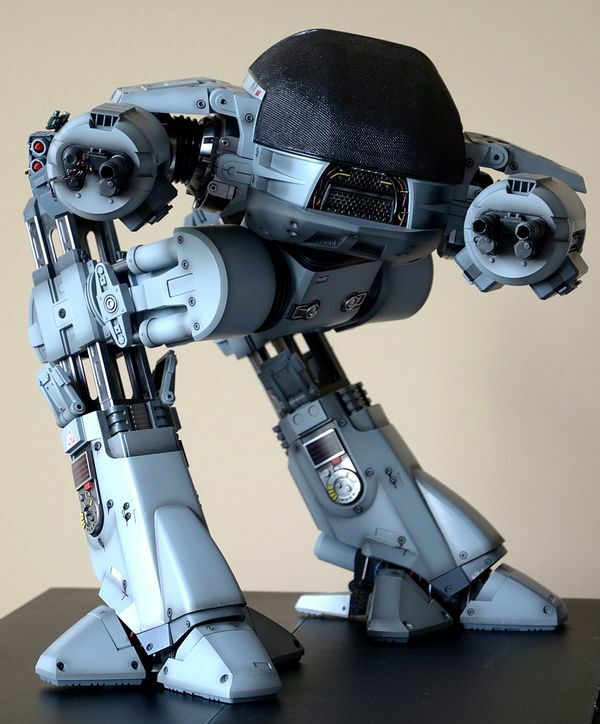 A Robocop collector would no doubt have a different opinion than the casual collector. I base my value on the work that I see and what I speculate it would take to produce. This may not be inline with how others rank value but as a customizer and a working designer, I can’t ignore how much I assume it takes to produce. 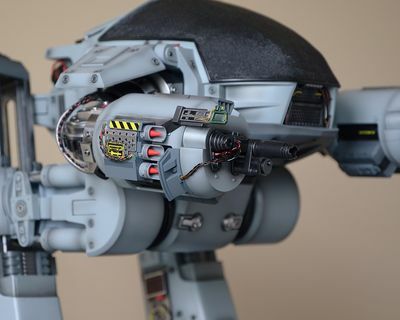 North of $400 is large amount of cash, no question there, but what I see is a large collection of parts that are designed, sculpted, painted and assembled. This is twice the price of the original, but I would say this is easily twice the product. Hot Toys is continuing to raise the prices of their figures but I would argue that the quality has also taken equally great strides as well. If I were to compile all the scores and average them out, this score would be a lot lower, but I don’t see them all being scaled equally. In my opinion, sculpting and paint far out way any of the other areas. I know the sound features have been discussed at great lengths on the chat boards, but for me it really just doesn't factor much into my opinion of this figure. It's a beautiful and pretty accurate representation to what we saw on the screen. A figure like this, is probably the closest most of us will get to fulfilling the dream of having the stop motion puppet from the movie. 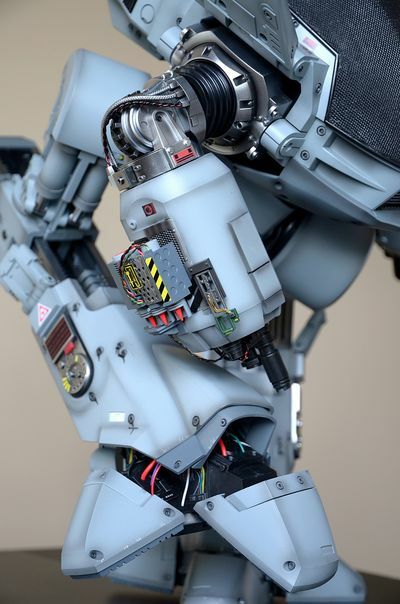 ED is just a great design that is wonderfully executed by Hot Toys. 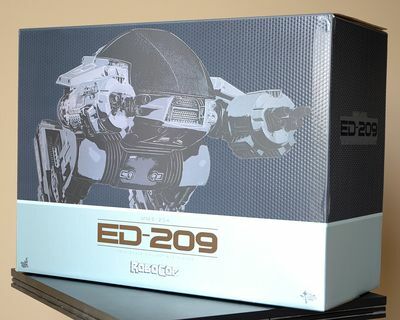 - Alter Ego Comics has the ED-209 for $378, along with the other upcoming Hot Toys releases. - Fanboy Collectibles comes in at $400. - Sideshow has him for $410. - Big Bad Toy Store is also at $410. - Corner Store Comics is at $410. - Entertainment Earth is at $580 with free shipping. - or you can search ebay for a bargain. 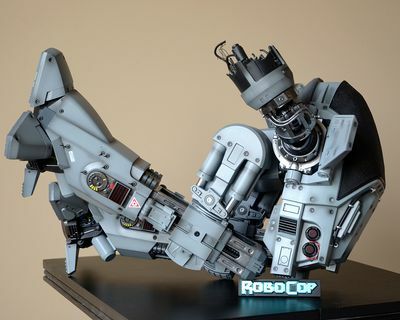 Other Robocop reviews include the cool Sideshow Premium Format statue, the original Hot Toys Robocop, and the first ED-209. On a smaller scale, they did a Movie Maniacs version, and there's some action figures for the reboot movie. This product was purchased for the review by the reviewer. Photos and text by Robbie Jones.